Lipstick and Lightening: Happy Halloween and Day Of The Dead makeup! 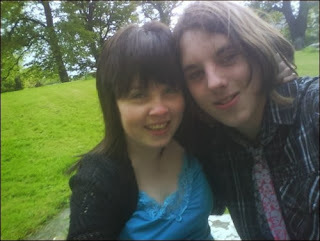 We aren't even a year together here, but it's my favourite photo. My best friend and her girlfriend threw a great Halloween party at their house on Saturday, and I went as the Mayor of Townsville from The Powerpuff Girls, an old show that used to be Cartoon Network, damn, I really miss that show, I always wanted to be Buttercup. It was a great night, and I wandered up to bed at half five. The Friday before, I was still at their house, we had a Chinese and Cat and myself carved ourselves a nice little pumpkin. Then, we proceeded to hang up some Halloween decorations, bare in mind I am only 4 11'' and Cat is just a little taller than myself. Do not underestimate the hilarity of two shortarses trying to hang up Halloween decorations! As neither myself or James were exactly overflowing with money, we've decided to keep our plans for today simple, but in my opinion, perfect. We're going to watch Tim Burton movies (my favourite director ever <3), get in dinner, and have a load of junk food, the perfect night in. :) as he loves Star Wars, I really can't wait to see his face when I give him his present. ;) As it is Halloween, I decided to do the gorgeous Day of the Dead make-up, I absolutely love it. 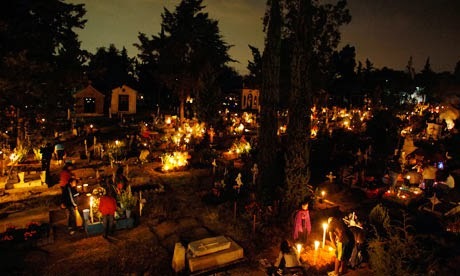 For those of you that don't know, Day Of The Dead, or, Dia De Muertos, is a holiday celebrated on Halloween to the 2nd of November in Mexico. Family and friends all gather together to pray for and remember their loved ones who have passed on. 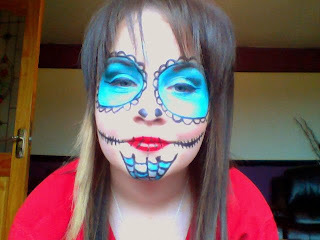 This very popular make-up is inspired by the ornamental sugar skulls that would be left on their graves. It's such a beautiful tradition I think. It's only recently I've really gotten into the more theatrical and special effects side of make-up, it's so interesting, I will be experimenting alot more with it, especially as my best friend Aoife gave me a bottle of liquid latex to make fake skin with, yay! Dia De Muertos gathering at a Mexican graveyard. Beautiful. Now, for this look, I've decided to leave out the white face paint, as there is not a huge selection of face paint in Tullamore, and the ones they have, would smear very easily! But not to worry... For this look, I used just a normal black pencil eyeliner to do the outlines, I tried to use the Essence 2 in 1 eyeliner pen for lines and filling in the areas to be blackened, and it was absolutely USELESS. It ran out too quickly, I had barely used it! So, I used the tried and loved Essence liquid eyeliner, and that worked grand. For the turquoise, I used Essence Long Lasting eye pencil, because a bit broke off, I would only click up a small bit at a time, otherwise, it worked perfectly. For the lips, I used Rimmel Lasting Finish in shade 01. The tips I got for this look, I got from this extremely helpful tutorial below. And here is the finished result! I have never done this type of make-up ever and I only had one practice run, overall I'm happy with how it turned out! The one thing I really love about this look is you can be so creative with it, colour and design wise, there's not really any restrictions with it, just play around and have fun with it!